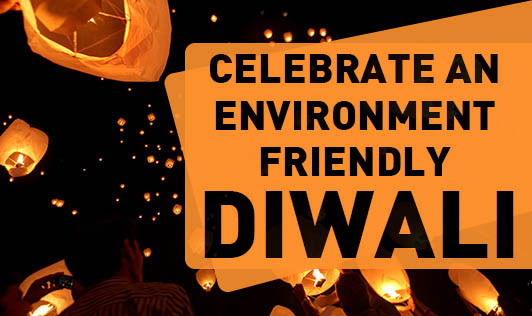 This article is to bring in awareness about celebrating an ‘environment friendly diwali'. Say ‘No' to fire crackers and ‘Yes' to life: Did you know? The crackers we burst involves labor of hundreds of children behind the scenes. The substances handled are extremely toxic and release poisonous gases leading to the death of many child laborers. Let us get back to the traditional system of celebrating diwali which includes, decorating and lighting up the house with candles, earthen lamps, rituals, organizing small get- to-gethers with family and friends, and exchanging of gifts. This is the idea of celebrating and spreading the joy of light and love. It's about time we turned down the intensity of celebrating this festival with crackers and play our part in controlling pollution to the environment. • Giving our house a new look or do something new. • Making a new healthy resolution. • Make it a special day for the family. • Do your bit of charity. • Say a ‘big NO' to fire crackers. Let us celebrate Diwali in our own unique way with an explosion of joy andlove instead of noisy crackers! Tell us what different you will do this diwali.